Can England make it 5-0? Australia tried hard but failed again. In Today’s Dream11 Fantasy Cricket Match Prediction of ENG vs AUS 5th ODI, we will cover probable playing 11, fantasy cricket news, toss prediction and pitch report of Old Trafford, Manchester. In case you haven’t watched the 4th ODI, you can watch the highlights below. Who Will Win the 5th ODI Match, Between ENG vs AUS and Toss Prediction? Where Can You Watch the Live Streaming of ENG vs AUS, 5th ODI or Channels to Watch? What is the best combination of players for Dream11 and Fantasy Leagues for 5th ODI Match? Australia has lost their last five matches back to back. England are one step behind to make it a 5-0. This is the last ODI match of this series and Australia will definitely want to finish the series being on other side but it seems difficult as ENG seems to be one of the best team and they are a very strong team. According to our astrology prediction, ENG will win the match. The team winning the toss should opt to bat first as the batting in first half is easier as compared to the second. It will be a high scoring game. According to our astrology prediction, ENG will win the toss and ask AUS to bowl first. Date: The match will be played on 24th June 2018 (Sunday). 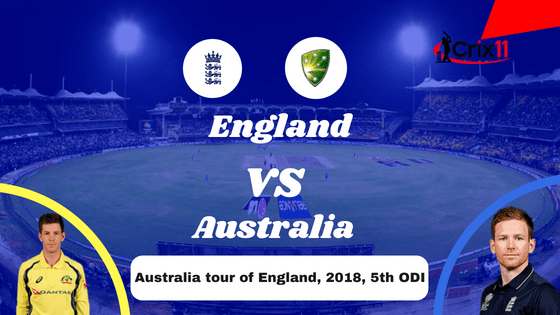 Match: Australia tour of England, 2018, Aus vs Eng, 5th ODI. The Pitch of Manchester, Old Trafford is a batting paradise. It will be a nightmare for the bowlers. All the three matches played here in the recent times were 300+ scores. Although the wicket is a batting friendly, the seamers and the spinners can take the wicket and this could only happen if they bowl in a good line and length. A very tight and disciplined bowling is required to stop the batsmen. Mostly sunny and sunny, this is how the weather will be throughout the day. The cricket fans and fantasy cricket users can enjoy the complete game as there is no sign of rain. The temperature is expected to be 19-Degree Celsius and the humidity to be 53%, which may rise up to 61%. Note: Due to the sunny weather the spinners will get some extra help. The average first inning score of this ground is 214. The average second inning score of this ground is 192. Highest total on this ground is 318/7 in 50 overs by SL vs ENG. Lowest total on this ground is 45/10 in 40.3 overs by CAN vs ENG. Australia has failed to win a single match in last five matches. Eng has won five matches out of five matches. In the last encounter, England won the match by 6 wickets with 32 balls remaining. In overall encounters, ENG has won 60 matches and AUS has won 81 matches. ENG has won 41% of the games and AUS has won 55% of the matches. Note: If you have teams previous clash record then you can easily know which team can win. Although the percentage of Australia is high, they have underperformed in this series. Glenn Maxwell shoulder problem has increased the worries of Australia. Maxell was rested in the previous game. He is very likely to play today’s match as he is recovering fast. Inclusion Nathan Lyon has definitely added some value in the Australian team and he is most likely to retain his place. Aaron Finch, Shaun Marsh, Alex Carey, Tim Paine (capt & wk), Jhye Richardson/Kane Richardson, Billy Stanlake, Travis Head, Marcus Stoinis, Glenn Maxwell, Ashton Agar, Nathan Lyon. Aaron Finch, D’Arcy Short, Jhye Richardson, Marcus Stoinis, Glenn Maxwell, Kane Richardson, Tim Paine (c & wk), Alex Carey, Nathan Lyon, Travis Head, Michael Neser, Shaun Marsh, Andrew Tye, Ashton Agar, Billy Stanlake. Liam Plunkett may return back in playing 11 as England will want to finish the series as a complete whitewash. Jake Ball may play in place of Mark Wood. Seeing the hectic schedule ahead, England Team management may give rest to David Willey. Jason Roy, Alex Hales, Eoin Morgan (captain), Moeen Ali, Liam Plunkett/Craig Overton, Mark Wood/Jake Ball, Jonny Bairstow, Joe Root, Jos Buttler (wk), David Willey, Adil Rashid. Jason Roy, Alex Hales, Mark Wood, Liam Plunkett, Jake Ball, Jonny Bairstow, Sam Curran, Jos Buttler(w), Joe Root, David Willey, Tom Curran, Eoin Morgan(c), Adil Rashid, Moeen Ali, Sam Billings, Craig Overton. Fantasy Cricket Expert Tips: Jos Butler is a better option compared to Tim Paine. 89.59% of the fantasy users have selected Butler in their Dream11 Team and 10.41% of the users have selected Tim Paine. Make a combination of the above players for multiple teams. Fantasy Cricket Expert Tips: The above players are most likely to score runs today. Make a combination of the above players more multiple teams. Fantasy Cricket Expert Tips: The above players are most likely to contribute with the bat and ball. Make a combination of the above players for multiple teams. The wicket will favour the batsmen and it is most likely that it will be a high scoring game. Try to take hitters in your team. The England Spinners are in good touch. Try to include them. Conclusion: This is it for Today’s Dream11 Fantasy Cricket Match Prediction of ENG vs AUS, 5th ODI Match, which will be played on Sunday 24th June. We have covered all the details required to win any fantasy leagues. We have covered players recent and past performance, dream11 guru and crictom prediction, all the latest news and updates of Australia Team and England Team, weather report of Nottingham, dream 11 best teams, keys players, the best choice for captain and vice-captain, where to watch the live match of AUS vs ENG, 5th ODI and the details of live streaming of Australia tour of England, 2018.